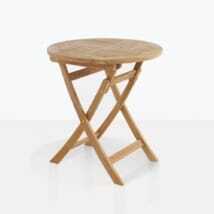 In need of a petite yet tasteful teak table that has versatility as well as being an excellent dining table? 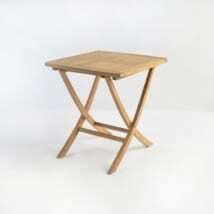 Look no further than the Square Teak Folding Table! 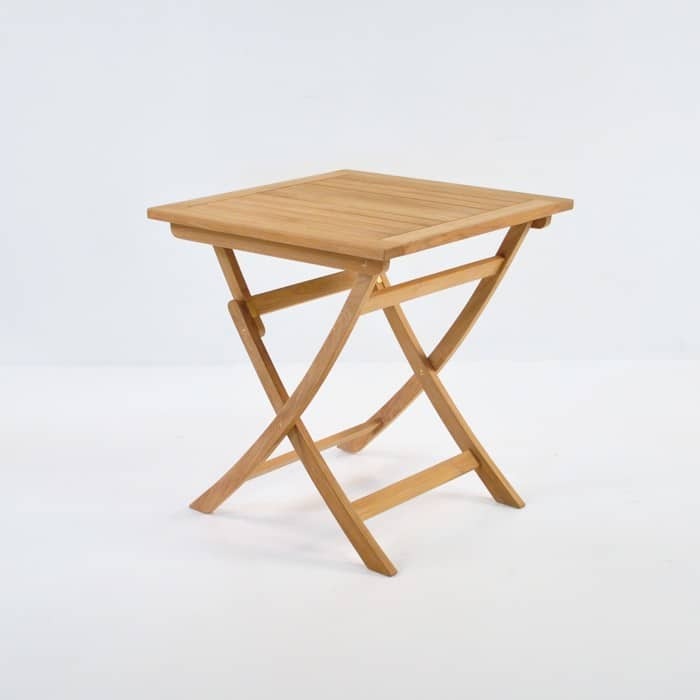 At 27 inches, this suitably smaller footprint table is an ideal choice for a dining table for two in a courtyard or patio setting, with the added element of being able to fold away easily for convenient storage! While this lovely teak folding table when fully extended is solid, looks dignified and is a charming place to have a quiet meal with a loved one, it is completely and utterly painless to put away! Simply fold the table top into the legs and you have a flat package that can hideaway in a garage or storage area. Make it a completely accessible set and team up with folding chairs; immediately giving you a portable dining set ready to place on the patio or take out to the beach to add a sense of occasion to any setting! 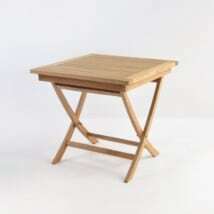 The Square Teak Folding Table 27” is made out of – you guessed it! – none other than our preferred choice of wood material: A-Grade Teak. Kiln dried exquisitely from an aged teak tree – at least 40 years old in fact – these pieces of wood retain the natural rubber and oil from the trees aging process, meaning the furniture that is created from them is 10 times more durable and better looking than lesser grades of teak and most other types of wood! A-Grade Teak looks amazing if you let it weather too! Some of our customers wish to retain the honey color, and this is easy to do. However, we love the look of the silvered off look of our furniture, so easy to maintain and kept looking stunning with a simple clean every few months! Just as you wipe down your indoor dining table after eating, we recommend that you wash your teak wood to keep its beautiful shine and feel. Take a moment to look at our blog to see educational videos and information about how to care for your teak and our many other product lines. Complement your Square Teak Folding Table 27” with two teak folding chairs for a warm, inviting and classic look as well as the perfect spot for a morning croissant and cafe au lait! After a modern yet distinguished look? Try this excellent table with a couple of Batyline® mesh stacking chairs, complete with #316 Stainless Steel for a sleek and contemporary set you are sure to enjoy hours in. While you’re here, why not look at our top range of quality Sunbrella® Umbrellas to create a shady spot for you while you are dining. Need a place to recline after a long day? Browse our excellent range of sun loungers and relaxing chairs and begin to be fulfilled as you make the most of your outdoor area! Inspire yourself to extend your living space to your outdoor area. 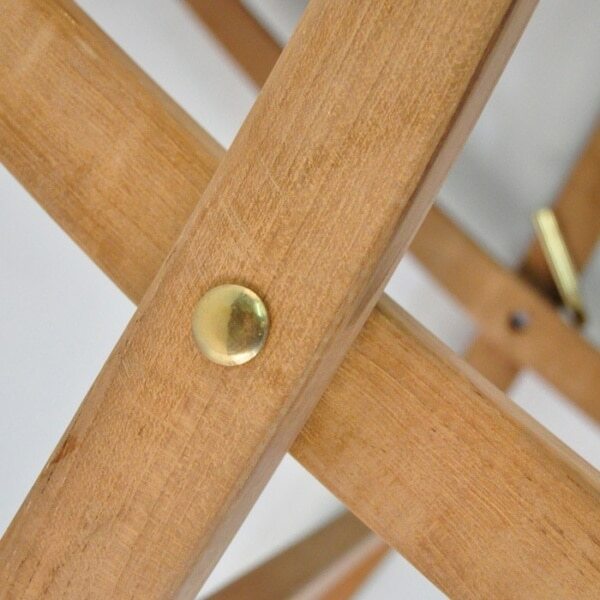 At Teak Warehouse we carry not only premium quality A-Grade Teak but also a wonderful range of alternative products that are also luxurious outdoor furniture whilst being top range marine quality. Choose from all weather wicker, #316 Stainless Steel, Concrete, Batyline® mesh, Sunbrella® and of course A-Grade Teak materials to orchestrate a fabulous look that suits the design of your space. Our furniture, though sold as wholesale, carries a high level of sophistication which remains unrivaled. Teak Warehouse is proud to carry beautiful, elegant, classic pieces as well as modern, on-trend items giving you the freedom to complement your home and tastes. The Square Teak Folding Table 27” is a versatile piece of furniture that can easily store in the trunk of your car, in a garage or cupboard. Enjoy the flexibility of a truly brilliant piece of furniture. After something bigger? Look to the same table in a 31 inch model! At Teak Warehouse, you only have to ask! We often carry the same model in different sizes or can recommend another style that will fit your space – our incredible team of salespeople are highly knowledgeable in our product and will be able to direct you to lines that will suit your taste and space! So call us today – together we will create a stunning space you will adore for years and years to come.